Glen Jones - "This Is The Wind That Blows It Out"
Throughout the career of Boston post-rockers Cul de Sac, guitarist and founding member Glenn Jones has never been shy about his love of traditional acoustic music. In fact, teaming up with one of his idols, John Fahey, Jones and the band recorded their experimental acoustic masterpiece, The Epiphany of Glenn Jones. But Cul de Sac has always utilized traditional sounds not as an end to themselves, but to push the boundaries of modern music further and further. 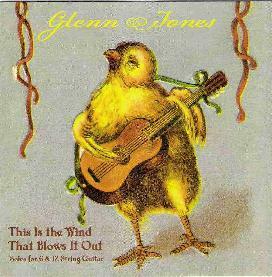 On his first solo acoustic guitar instrumental album, Glenn Jones dispenses with the modern aesthetic, and instead delves deeply into the traditional, and comes up with a beautiful, haunting, and indeed poetic album in the form of This Is the Wind That Blows It Out. Jones’ fingers slide over taut, dry strings, drawing out evocative melodies. Like his label mate, Stephen Basho-Junghans, Jones draws on rural Americana, but because Jones, unlike Basho-Junghans, is American, he can draw on his own culture and his own past to suggest a timeless appreciation for the world he grew up in. Jones has a strong sense of melody, imbuing his songs with great emotion. He’s also a vastly under-rated guitar player, which means he’s up to the challenge of succeeding great acoustic musicians of the past such as Leo Kottke, Robbie Basho, and John Fahey. There’s even a direct nod to his main influence in the form of the jaunty slide guitar of Fahey’s Car. Don’t expect any of the Krautrock and surf rock influenced explorations Jones’ band usually gets up to, but don’t expect to be disappointed either. This Is the Wind That Blows It Out is pure listening pleasure. Great music for lazy, sunny Sunday afternoons in the country, or at least for bringing those kinds of afternoons to mind, wherever and whenever you may be.